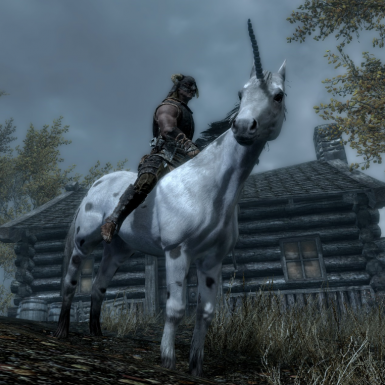 This mod adds a Unicorn mount that can be summoned from Hircine's Hunting Grounds. 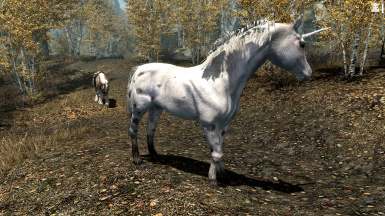 If you plan to remove the horn and use this as a generic horse-replacer, you must get permission from me (opusGlass) and more importantly you MUST have permission from Fierymarigold, since that would be considered modifying / improving upon their mod, and their permissions section says you must ask permission before doing that. I myself am currently requesting permission to do this. 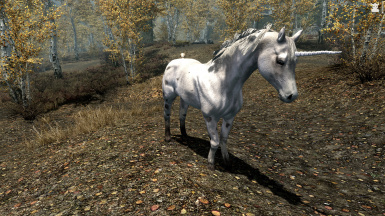 "The Hunter comes here from the Hunting Grounds to hunt new prey, or he brings prey native to the Hunting Grounds, like the Unicorn, to hunt in new forests." 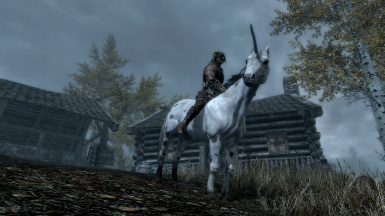 This mod brings the Unicorn, seen in TES4: Oblivion, into Skyrim as a summonable mount. 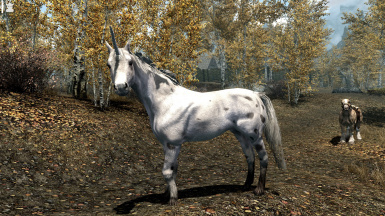 The Unicorn is a peaceful daedric creature native to Hircine's Hunting Grounds, though it is sometimes found in Tamriel. 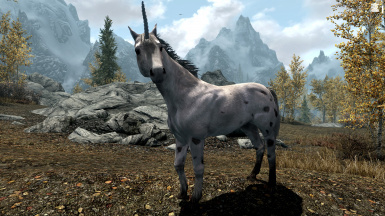 All Unicorns are wild and untamed, so it wears no saddle and its mane is unkempt. 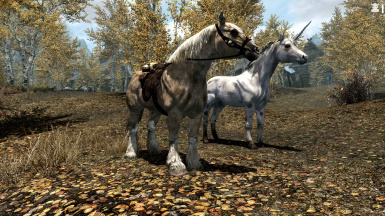 However, like any other conjured beast it is bound to its summoner's will, making it a devout steed. 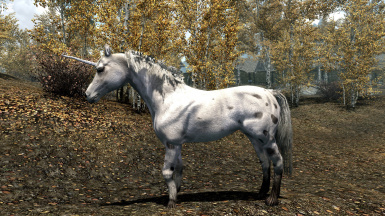 I created this Unicorn for my upcoming quest mod, The Hunting Grounds: Echoes of the Bloodmoon Prophecy. 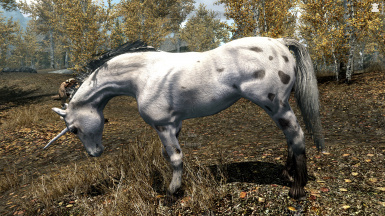 That project is still early in development, so I'm releasing this as a standalone mount. If you are an exterior or interior level designer and interested in creating content for the Hunting Grounds project, please contact me! 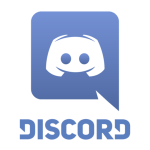 Install: Use a mod manager or install manually, then enable the plugin. Compatiblity: No compatibility issues are known, and none are expected. No vanilla records are altered. Some objects have been added to Bloated Man's Grotto, but they are very unlikely to conflict with anything. 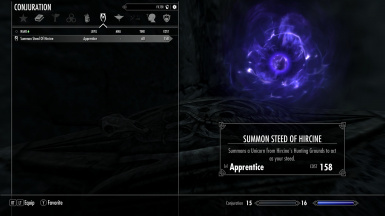 Where is the Spell Tome / How do I get the spell? It is in Bloated Man's Grotto, but it is well-hidden. 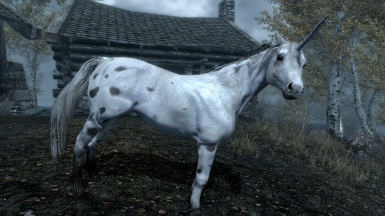 It should be a fun hunt to find it. 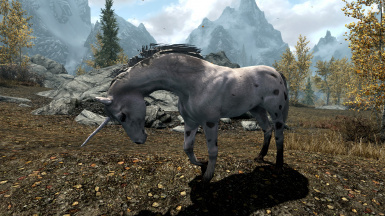 Assuming you aren't in the middle of the Ill Met By Moonlight quest (or have recently completed it), it is near a spriggan and a dead elk. And no, it's not inside a treasure chest. If there are no spriggans then your map is probably in IMBM mode. Your hint is to look around the final clearing along the path. 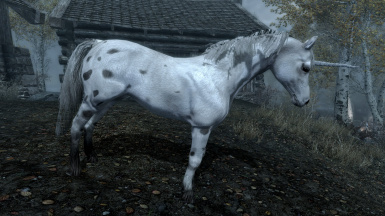 Note that the spell does NOT work inside Bloated Man's Grotto, since you can't bring horses there.